Notes: Based on the manga by Nakazawa Keiji, which in turn in based on the author's first-hand experience of the atomic bomb blast at Hiroshima in 1945. In other news, Streamline Pictures recently lost all rights to both movies to Geneon. World War II is just nearing its close, and life is already pretty rough for young Gen and his family. With not enough ration stamps to last them through the month, the family is scrimping and pinching wherever possible just to make ends meet, not to mention that Gen's mother is expecting to give birth any day now. And then, one fine afternoon, the Enola Gay makes its way across the Hiroshima sky, letting loose on its citizens the most devastating force ever conceived by man: the atomic bomb. After the initial destructive blast, which instantly wipes out most of the population in an all-consuming flash, the survivors find themselves struggling just to exist in a city now reduced to a gruesome, radioactive landscape. Gen and his family must somehow find a way to find sustenance and survive in this nightmare of a city where death is as abundant as the ashes. A semi-autobiographical retelling of history by creator Keiji Nakazawa. Whenever encountering an anime of this sort, a comparison to the masterpiece of war recounting -- Grave of the Fireflies -- is almost inevitable. From the subject matter alone, Barefoot Gen has the undeniable potential to deliver a greater impact than Grave. I mean, we're talking about the gruesome and agonizing deaths of a couple hundred thousand people via nuclear irradiation, not just two kids who simply starve to death. 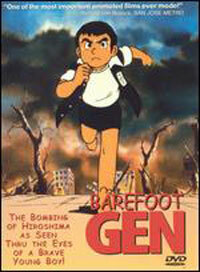 So, if given the choice, Barefoot Gen, right? Well, not quite. This is another case where the story isn't enough: it's how you tell it. And Barefoot Gen in all of its grandiose horror does a considerably inferior job of storytelling than Grave of the Fireflies does in its quiet simplicity. Where Grave is meticulously crafted, Barefoot seems thrown together. Many elements seem mismatched, resulting in a final product that seems more piecemeal than unified. The art and animation are of a crude, comical style that detracts from the reality of the history (imagine a really bad imitation of Ghibli's style). One feels inclined not to take the film too seriously when it literally looks like a Saturday morning Warner Brothers cartoon, and choosing this style for this sort of film is a decision that still baffles me. The dubbing job is barely adequate, with two really annoying voices being used for Gen and his brother (why does his younger brother sound older than him?). The overall story suffers similar maladies. For the first third of the film, the viewer is treated to an extensive background on Gen and his family's poverty along with numerous scenes of him and his bratty brother not getting along. It's too much, and it's not relevant enough to hold the viewer's interest. Barefoot blithely takes its sweet time getting to the real story, and when the bomb is dropped, it actually comes as a relief. However, even the second half of the story, while noticeably more focused, still fails to pull itself together to deliver that emotional "punch" the director must have had in mind. The characters all seem too comical, too unreal to lend any sense of sympathy or realism. There are many moments, though, when Barefoot comes very close to what it tries to accomplish. Although the art may be crude, it still manages to graphically portray the victims of the bombing in stomach-churning detail. Several scenes in the latter portion of the film could probably hold their own against anything Grave has to offer. Just when the film starts to shape up, though, the director usually cops out and resorts to (ugh) preaching, as if the visual evidence wasn't enough. The overall impression is one of getting browbeaten, and it greatly lessens the emotional impact of the production. Add on top of this numerous (and completely inappropriate) attempts at slapstick humor scattered throughout both halves of the film, and you get something that definitely doesn't seem like the eye-opener it's supposed to be. In short, Barefoot Gen, while not terrible, disappoints many of the exact places it shouldn't. A lot of times it comes painfully close to what it should be, but there are still too many flaws to consider this a true classic. One thing I do have to say, though: I will never read about the bombing of Hiroshima (or Nagasaki, for that matter) with the same dispassionate air I used to. I guess in that regard, Barefoot Gen wasn't that far off the mark. It does seem like kind of a shame, though. Recommended Audience: Streamline was thoughtful enough to put the label "NOT FOR KIDS" on the cover of this title, and I couldn't agree more. While the style is reminiscent of a kiddy cartoon, the graphic portrayals of the bombing victims go far beyond anything any kid should be allowed to see, and will probably sicken even the most hardened viewer.